The Trump administration outcasts: Where are they now? 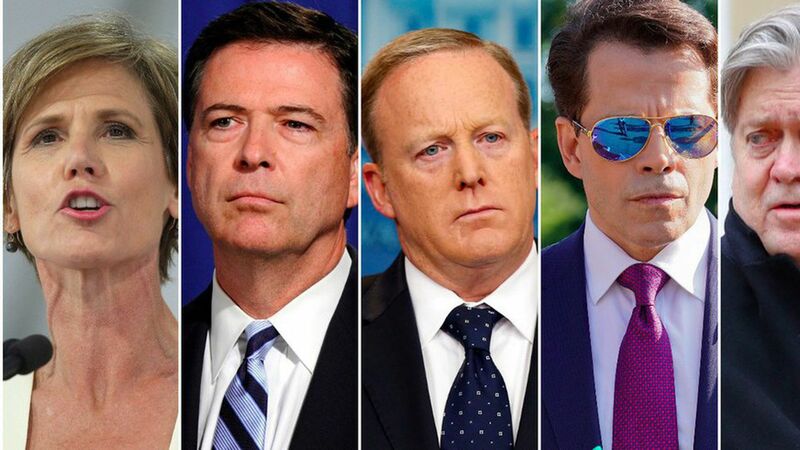 The first seven months of Donald Trump's presidency have been marked by a series of high-profile exits — from Michael Flynn and James Comey to Sean Spicer and Steve Bannon. Now that those officials have left their powerful Washington positions, many of them are mapping out the next steps in their careers. Fired from her role as acting attorney general on Jan. 30 for telling the DOJ not to defend Trump's travel ban. Democrats in Georgia started recruiting Yates to run for governor the 2018 race after she was fired. But Yates quickly shot down the idea in an interview with the New Yorker's Ryan Lizza in May: "I recognize that I may have a voice that I didn't have before. And part of what I want to be able to do is to figure out how I can responsibly use that voice in a way to impact things that I think really matter," said Yates. "I just don't know what form that takes." She's certainly staying on the radar, most recently by slamming Trump's pardon of Joe Arpaio. Resigned from his post as National Security Advisor on Feb. 13 after it emerged he had misled Vice President Pence about conversations with Russia's ambassador to the U.S.
Flynn's brother Joe told the AP that Flynn had opened a new consulting firm, called Resilient Patriot, LLC in June, to advise private equity firms. Flynn has also reportedly been setting up a fund to help him raise money to pay for his legal bills stemming from the Russia probes, per Bloomberg. The AP also reported in June that Flynn has been spending most of his summer in Middletown, Rhode Island, surfing and golfing in the area where he and his wife grew up. Fired as FBI director May 9 amid heightened tension surrounding the Russia probe. Comey later claimed that Trump had requested his "loyalty." The AP reported in early August that Flatiron Books had purchased Comey's book about his career in government. In a news release announcing the deal, Flatiron hinted that Comey would reveal new details about his conversations with Trump. The exact value of the deal is unknown, but three officials close to the negotiations told AP that it "topped $2 million." The book is set to hit shelves next spring. Comey is also beginning a new lecture series at Howard University, starting in September. Resigned as press secretary on July 21 after Anthony Scaramucci was hired as director of communications. Spicer, who will remain at the WH until the end of August, recently signed with high-powered attorney Bob Barnett, who represents several top politicians and TV personalities, per Page Six, after meeting with "all the major TV and news networks, including NBC, CBS and Fox News." Note: Departing WH press secretaries have historically been coveted by major TV networks, with Josh Earnest, Barack Obama's last press secretary, working as a political analyst at NBC News and MSNBC. Spicer was also reportedly asked to be a contestant on "Dancing with the Stars" but turned down the offer, according to Fox News. Ousted from his role as WH chief of staff on July 28 after Scaramucci accused him of leaking information to the press. Priebus has largely kept quiet about what he plans to do following his stint at the WH, but he did tell CNN's Wolf Blitzer that he plans to, "take a little vacation, spend some time with my wife and kids and enjoy the future and continue to be supportive." Was asked to step down as WH communications director by newly-appointed chief of staff John Kelly on July 31 (after just 10 days) following his vulgar interview with the New Yorker. Less than a month after being ousted from his short-lived role as WH comms director, Scaramucci signed with veteran Hollywood publicist Howard Bragman. Bragman, who's represented famous people such as Monica Lewisnky and Barry Manilow, is known for his expertise in handling crisis communications for celebrities. He's stayed in the spotlight, doing TV interviews, receiving a standing ovation at a Long Island restaurant and tweeting self-effacing jokes about his White House tenure. Resigned August 7, but his last day at the WH was August 18. A senior WH official told Axios that he was "made aware he was going to be asked to leave... he was given the opportunity to do it on his own terms." The same day that news of Bannon's WH exit surfaced, Bannon returned to Breitbart News as Executive Chairman. According to Axios' Jonathan Swan, Bannon has told associates that Breitbart is his "killing machine" and that he's ready to go "thermonuclear" against the "globalists." Axios has also been told that Bannon is joining forces with the billionaire Mercer family, who are major funders of Breitbart. Bannon is also exploring starting a TV network, though it's unclear whether he is pursuing cable TV or if it would be online-only.